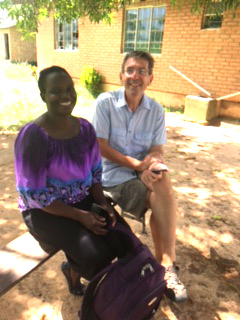 Former medical volunteers support Malawian volunteer nurse, Winnie who has become a valuable member of the Kachere Health Centre team. Kachere Health Centre offers medical care to a large catchment of around 26,000 people and they’re pretty much always busy. Data is collected on how many people use the Health Centre by Khumbo and Watson who are working on our Family Planning and Sexual Health project. 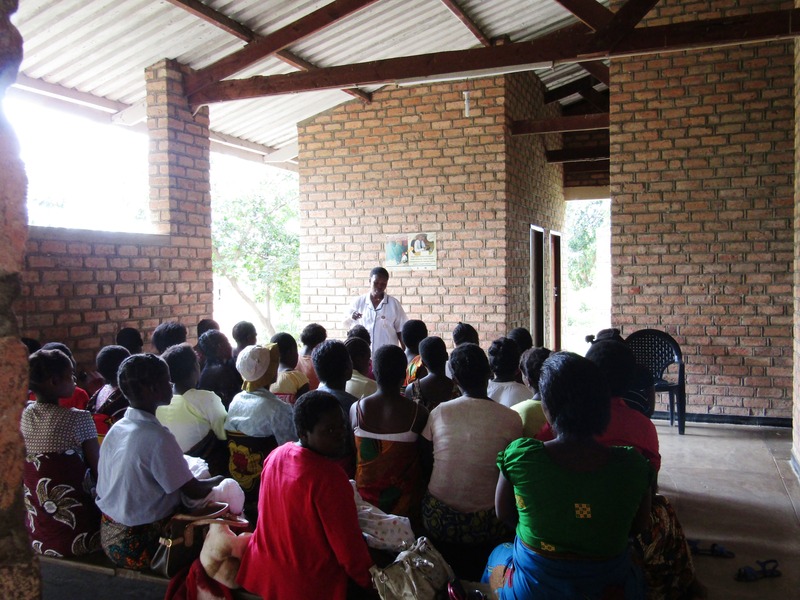 To give a guideline, in 2017 1,229 people received Family Planning. 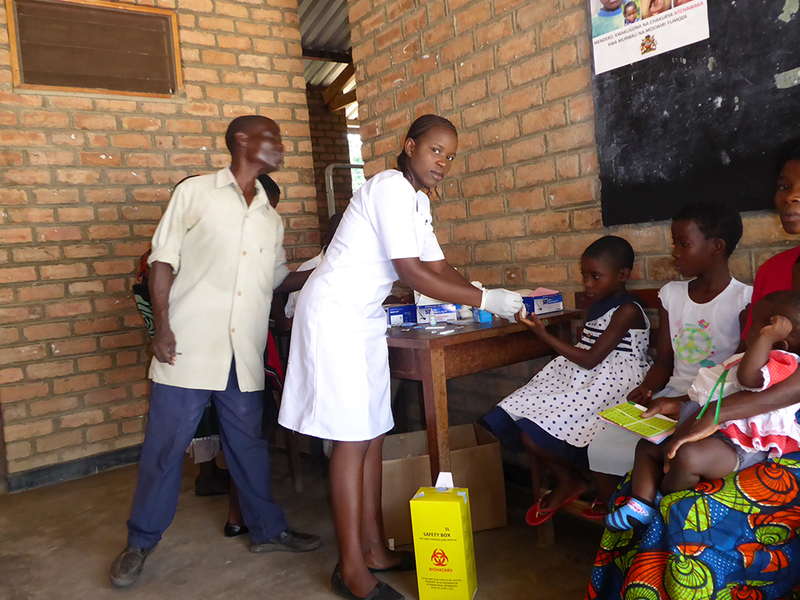 In the same year, 6,227 under 5’s were tested for malaria with 4,518 being positive and needing malaria treatment. In over 5’s, 10,856 were tested, of which 6,743 were positive. They also carried out immunisations for under 5’s on 8,351 children and 324 babies were born at the clinic that year. The Health Centre runs the usual clinics including Out-patients Department for malaria testing, HIV testing, blood pressure, diabetes, general and other ailments, as well as offering family planning, antenatal clinics, labour/deliveries, under 5’s and malnutrition clinics, STI management and treatment, voluntary counselling and testing (HIV), giving ARV’s to HIV patients, youth friendly services, and wound care. They also take any emergencies plus they have their Environment team who have been involved with the distribution and education when mosquito nets were delivered amongst other health-related topics. We think you’ll agree, this is quite a busy Health Centre! There were three clinical staff employed at Kachere with Eva as Medical Assistant, Janet as Nurse Technician and Esther a Community Midwife. However, since the 13th March, this has reduced to two as Eva was transferred to work in Lilongwe. The Health Centre is now running without a Medical Assistant. Along with her other duties, Janet will be carrying out consultations and prescribing for the Out-patients Department. “Without Winnie, Esther does the midwifery duties day and night without rest. 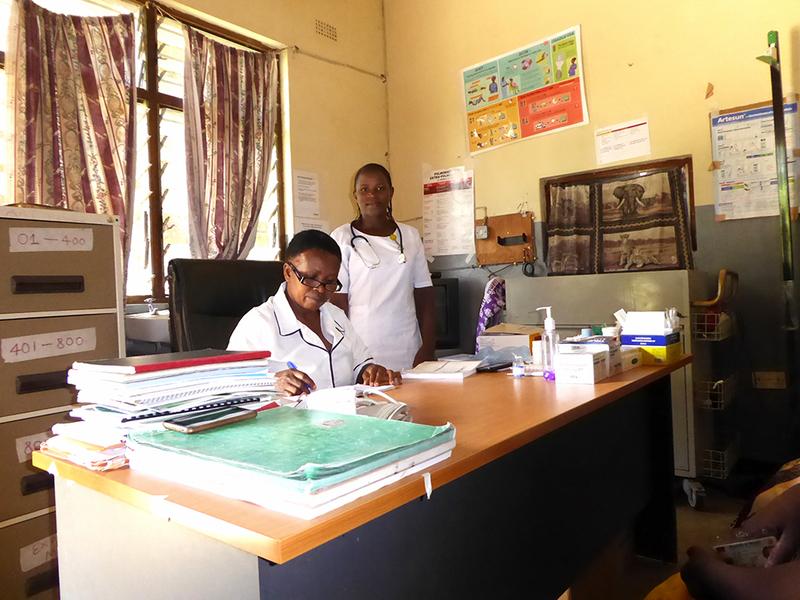 Winnie is a qualified community midwife who comes to the clinic every day and carries out the same duties at Esther. 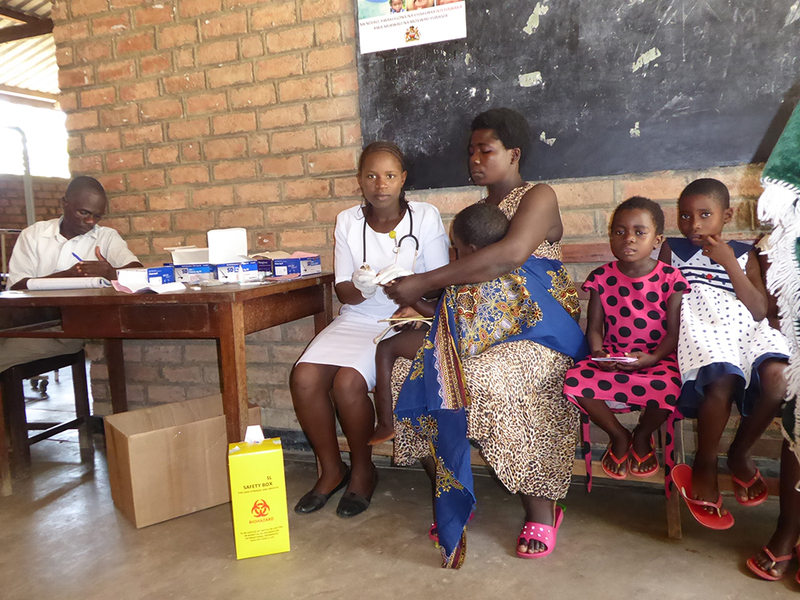 Her presence is helpful because together they manage the labour ward, run antenatal clinics and some community visitations to pregnant mothers. They do alternating shifts so when Winnie works in the day, Esther works in the night. They swap this round. It was absolutely clear what a difference Winnie is making so we reached out to our supporters and are so thankful to a previous volunteer couple who have agreed to provide an allowance to Winnie to enable her to support the Health Centre. We are not employing Winnie but supporting her with her volunteer role while she waits for a Government-paid role. She is extremely committed and very much needed as part of the team. This is a wonderful story in twofold; how even after getting an education and finishing her degree, instead of migrating to other neighbouring African countries like South Africa, Winnie has stayed to help her community, also how fantastic that we have volunteers who, having spent time with the community and understand the importance of these facilities, are willing to provide support when needed. Today is International Day of Forests, a day to celebrate and raise awareness of the importance of forests. The theme for 2019 is ‘Forests and Education’ and we believe education is key in all our projects. In Malawi, Africa, deforestation has reached a crisis point and most of the country is now deforested due to shifting cultivation, timber and charcoal production and firewood for cooking. There are very few protected forested areas and little control over how local people treat forested areas. 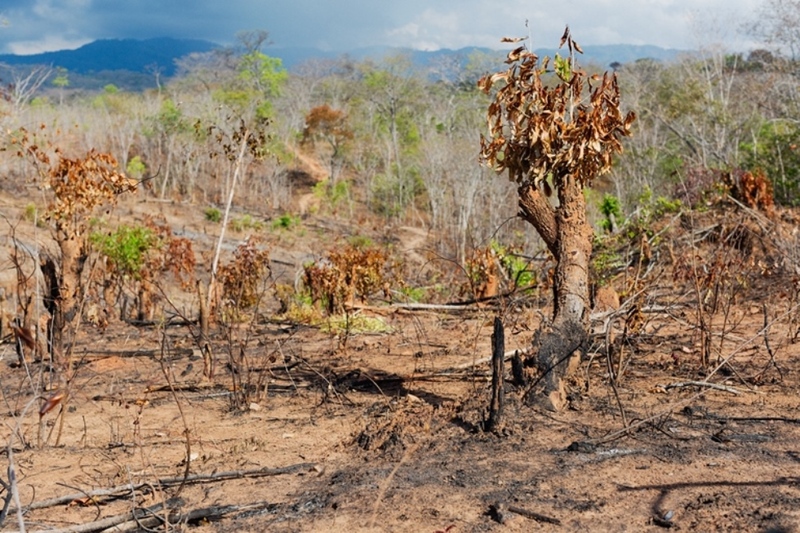 People move into the forested areas and clear trees to provide space for farming, they burn the trees where they fall, temporarily cultivate the land, often on sloping hills that are unsuitable for growing crops for more than one or two years, before the topsoil is washed away by rains rendering the soil infertile. Then they move on and do it all again in another area. The effect of burning after clearing the trees. Fortunately, in the north of Malawi we still have some forests left but they are disappearing fast as there is little understanding of the importance of trees in regulating rainfall. In areas where forests have been destroyed, periods of drought are common, leading to crop failures and food shortages. Our approach is very community led. Our environmental team inspire and work in partnership with District Forestry teams, local stakeholders and communities. We educate people living in the forested areas about the importance of protecting their forests. We help communities set up volunteer forest conservation committees and introduce bylaws to protect the trees, empowering them to be the solution. Since our Forest Conservation project started in 2007 we have established 170 Forest Conservation Committees and we are directly working with around 1700 people. We recently met with an active Forest Conservation Committee deep in the Kandoli hills, many of whom were previously destroying their own forest. Through education, they now understand the importance and feel empowered to protect their land. One fantastic Forest Conservation Committee in the Kandoli hills, who are passionate about protecting their forests. Through this project we are doing our best to reduce further deforestation in Malawi. 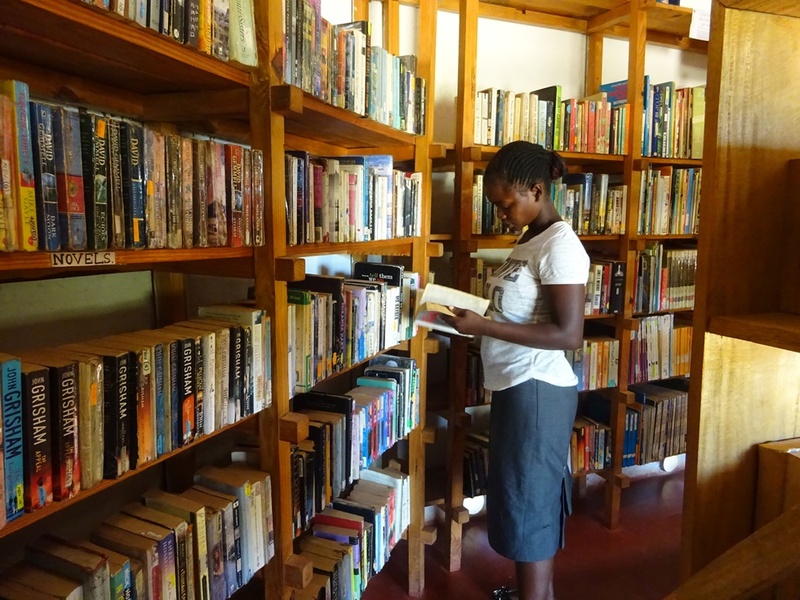 The RIPPLE Africa Community Library at Mwaya continues to provide local people with a brilliant selection of books including novels, local language books and textbooks. Head librarian Barton and his assistants John and Vitu had a busy 2018. 3,088 borrowers visited the library and they lent out 4,537 books, 592 books more than in 2017. They welcomed 157 new members too. 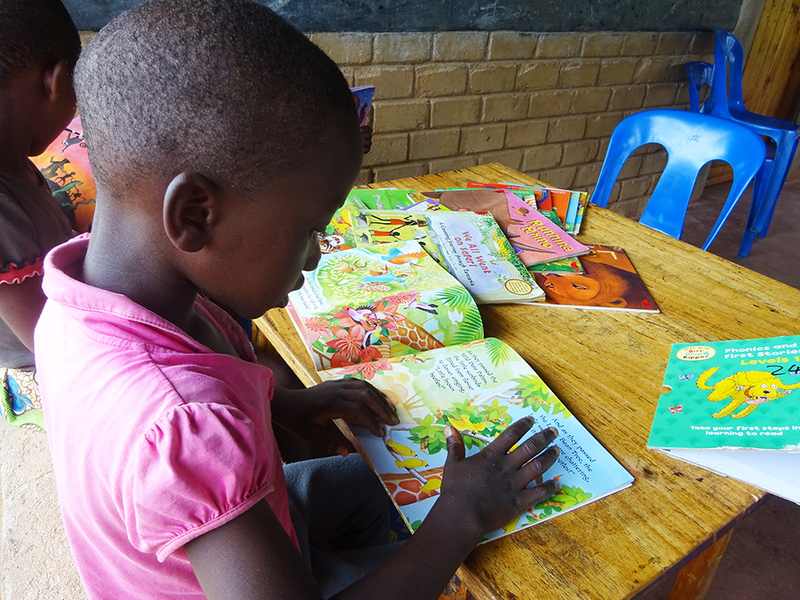 In 2017, data showed that the majority of the children’s books were never read or borrowed so a Children’s Corner was started to help engender a love of books among young children. The reading sessions take place every Saturday and those attending regularly are now able to choose the books they wish to read and there are teachers who can help them read them. 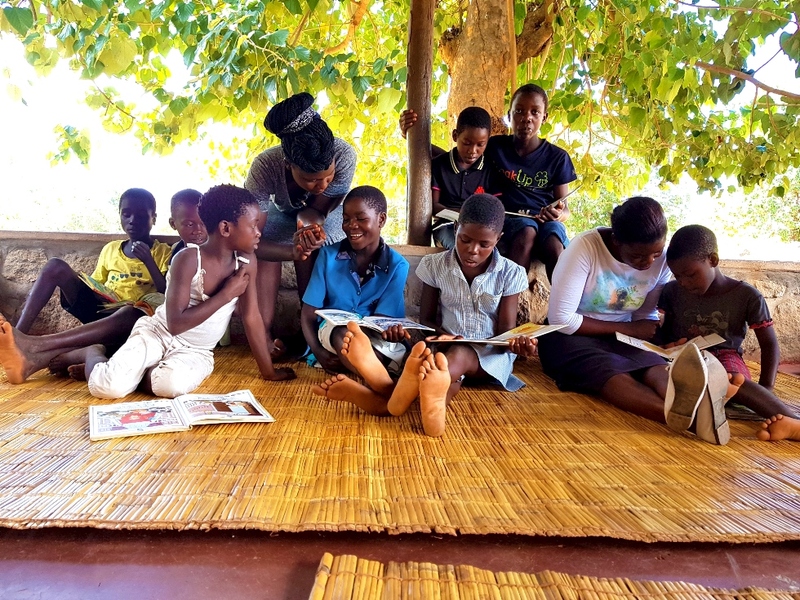 There is still scope for this reading club to expand and welcome more children but there is hope that now that Mwaya Primary School visit the library 10 times a week for their Library Lesson that the children will develop a love for books and feel more comfortable coming to read at the weekend. Library members reacted positively to a selection of new local language books and new novels. However there is now a demand for new textbooks as the government has changed the secondary school syllabus so all of the subject textbooks need renewing. Newspapers continue to be popular as are magazines such as The Week, and there are more members preferring to read at the library instead of taking books home. There are still more men reading the papers as they love to be up to date with football and general sports news, as well as looking at the jobs section. Kapanda Community Day Secondary School has a Peace Corps volunteer, Birgit McMullen, who has introduced school excursions to the library to ensure that all students, not just those living close to the library, are aware of the resource available to them. In 2018 they borrowed a combined 3,050 textbooks plus around 300 other books such as dictionaries and local language books. 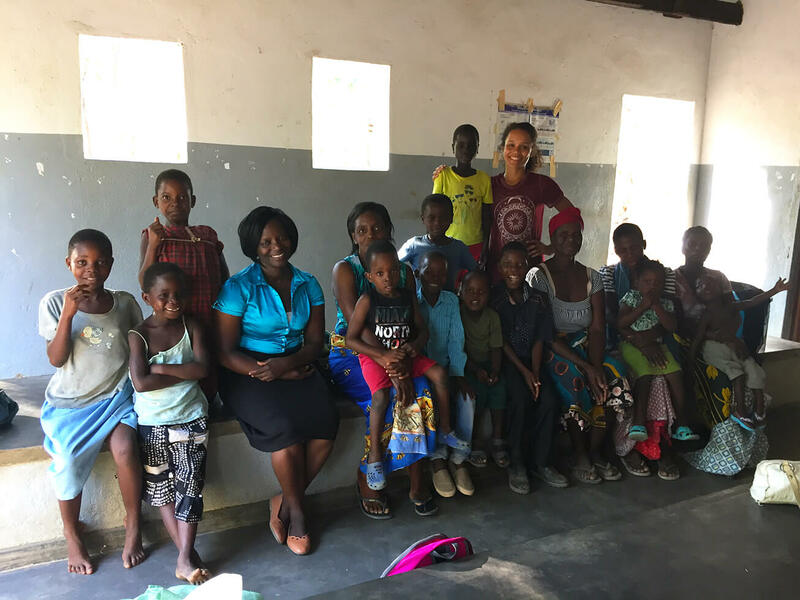 Birgit said “During the 2017/18 school year we have taken several excursions to the Mwaya community library. 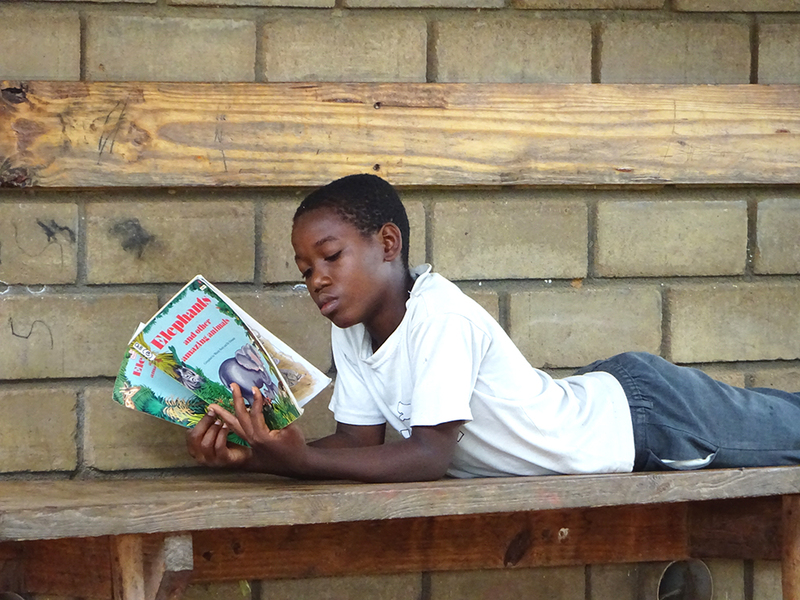 Kapanda CDSS does not have an on-campus library and it is difficult for students to find books to read. As a Peace Corps Volunteer teaching English, part of my role is to introduce students to the concept of libraries and their use. During DEAR (Drop Everything And Read) Day I invited Barton, the chief librarian, to Kapanda to give a presentation on the creation of the library, the structure, its many uses, and policies. After that we organised two field trips to the library where students were able to tour the different sections, learn about different genres of books, and sign up as members. Students then checked out books we used in class to learn about how to write summaries and book reports. Students have since continued to use the library to read and study. The RIPPLE Africa team would like to thank everyone supporting the library. You are helping to ensure it remains a great resource for the community. Watch our short film about Mwaya Community Library and how the local community are also benefitting from Adult Literacy and Children’s Corner. You can read the full report which illustrates the books borrowed and the library users for 2017 and 2018. We are absolutely thrilled to have been selected as a Dining for Women sustained grantee! 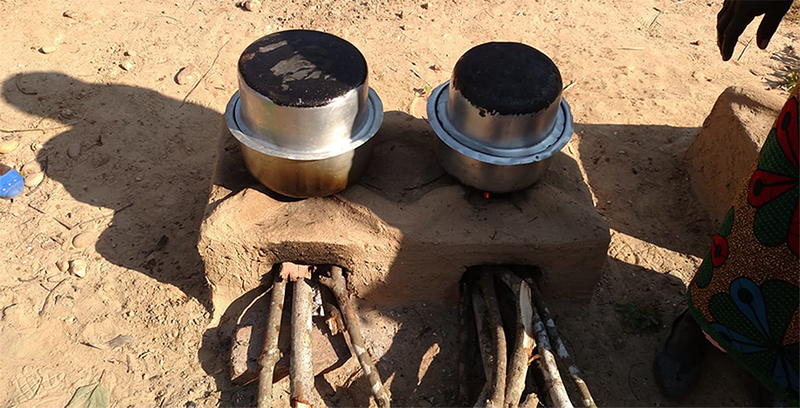 This $75,000 award over three years will enable us to provide 5,743 fuel efficient cookstoves to families residing in the Nkhotakota and Mzimba Districts of Malawi over the next three years. As a past grantee in May 2015, we so appreciate Dining for Women’s continued support for this important project! The Changu Changu Moto cookstove has the ability to transform the way women in rural Malawi cook. 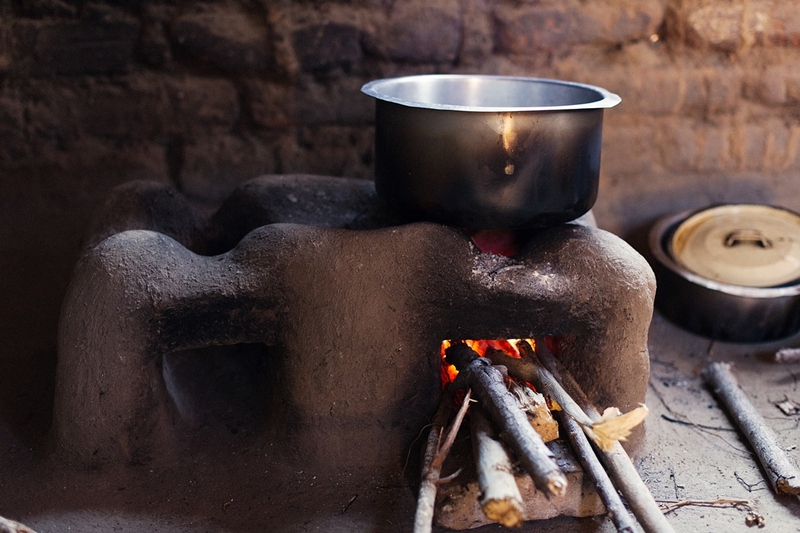 Because of the 66% reduction in wood use, reduced smoke production and incidence of burns – and the fact that food cooks more quickly – adoption of this stove by the women has been quick and easy. This is ultimately protecting the environment, providing health benefits, improving economic wellbeing, and empowering women. Since its introduction in 2011, 43,000 Changu Changu cookstoves have been adopted by Malawian women. One woman who benefits is Anita who is a mother of three and she loves her Changu Changu Moto. 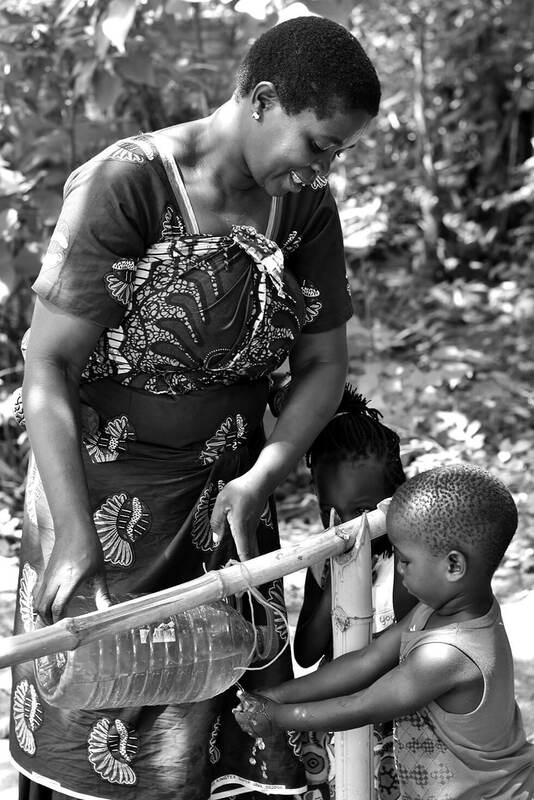 Her days are full caring for her children, doing housework, and managing her small farm. Anita has been telling us that the time that she used to spend collecting wood is now being spent on helping her children with their homework and planning her own future. She is determined not to spend her working life as a subsistence farmer as she is hoping to become a tailor so that she can bring money into the household to pay for her children to attend secondary school. Thanks so much to Dining for Women for helping RIPPLE Africa to help more women like Anita. Read more about Dining for Women here. 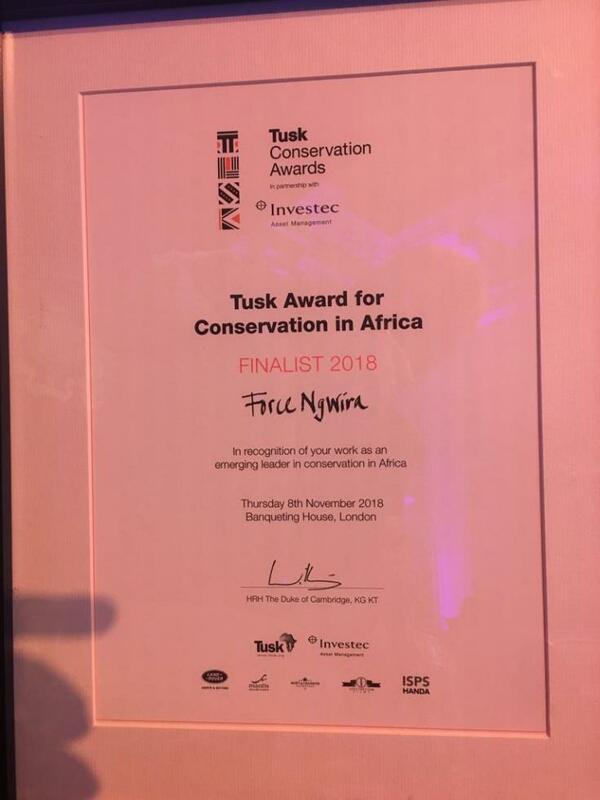 Congratulations to Force, Country Director for RIPPLE Africa, on being a 2018 finalist of the Tusk Awards for Conservation in Africa. The Tusk Conservation Awards celebrate extraordinary people, whose work and lives might otherwise go unnoticed outside their fields and Force has been selected in recognition of his work in Malawi, his passion for the environment and ability to work with people at all levels to achieve long-term sustainable change. Force started working in Conservation in 1998 when he became aware that his woodcarving business was damaging trees. He has come full circle and is now a dedicated Malawian environmental activist. 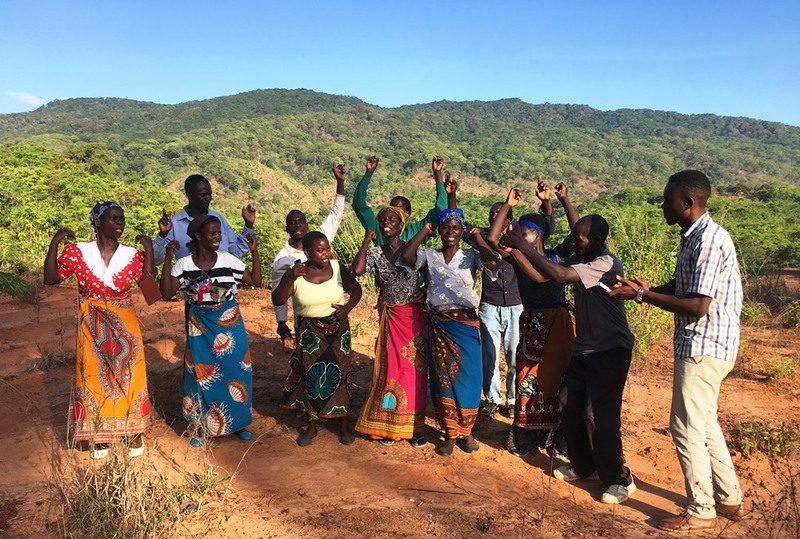 Force’s dedication to overcome challenges; to educate and empower local communities with the ability to work with people at all levels; to encourage his fellow Malawians to be equally committed to conserving their environment has made him, quite literally, a Force of Nature! This led him to being nomindated for the Tusk Award. 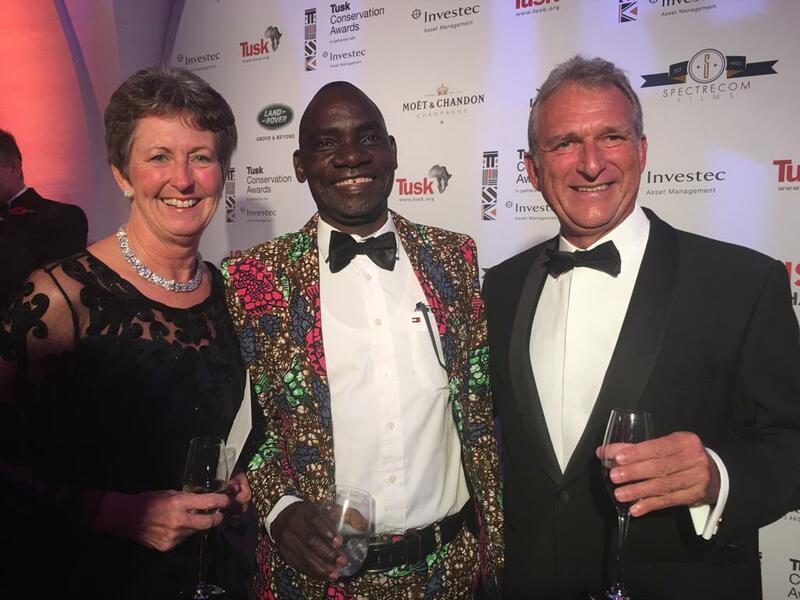 The Awards Ceremony was held in London and following all the excitement, subsequent meetings with donors and supporters in the UK, Force has now returned to Malawi to continue his important conservation work. 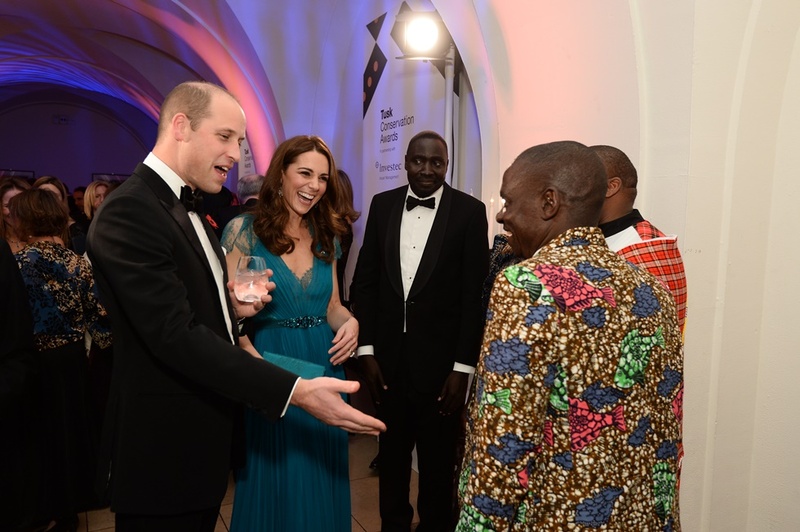 Force particularly enjoyed meeting the Duke and Duchess of Cambridge and tells us that the Duke appeared really interested in learning about our community approach to conservation. From the photo, it looks as though both of them were also impressed with his suit! Force was certainly a worthy finalist and we are extremely proud of him and all the members of his team for shining an international light on RIPPLE Africa’s work. We congratulate all the winners for their amazing contribution to conservation. 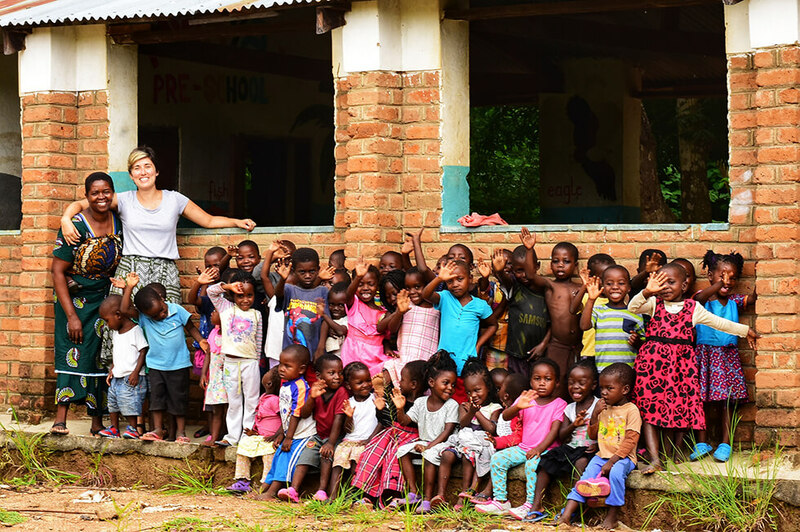 After spending the summer of 2017 with RIPPLE Africa, Jess returned to the UK to start an MSc in Human Nutrition. We welcomed Jess back when she wanted to carry out research for her dissertation project within the topic area of international nutrition/humanitarian work. Here’s Jess’s story. In my opinion the best way to immerse yourself in a different culture is to connect with people through local food. 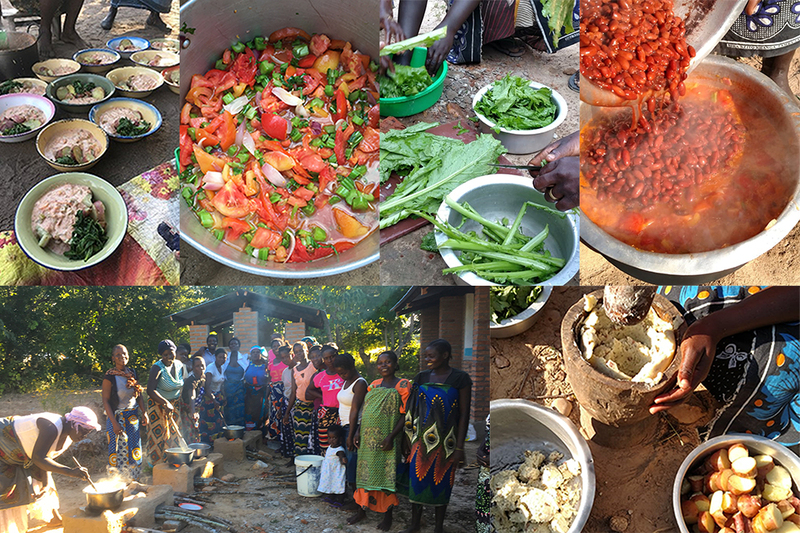 Therefore, I feel very privileged to have spent the past four weeks in Malawi cooking, singing and dancing with women from three small, rural villages. Whilst traditional meals often lack variety and nutrient density, the cohesive community makes every meal time an enjoyable social event. The Malawian diet comprises of predominantly starchy foods with Nsima being the staple carbohydrate dish consumed in vast quantities. The process of growing, storing, processing and preparing Nsima is an integral part of a Malawians daily life and deeply engrained in communal tradition. In fact, it is often stated that you have not eaten if you have not had Nsima, even after a full meal! Nsima is made from maize or cassava flour and water combined to form a thick paste which is piled into a large communal serving dish. Small handfuls are then broken off and rolled into a ball in the palm of the hand with the fingers. A small hollow is then made in the ball and is dipped into a small side dish of ‘relish’ comprising of sauce, vegetables, meat or fish. 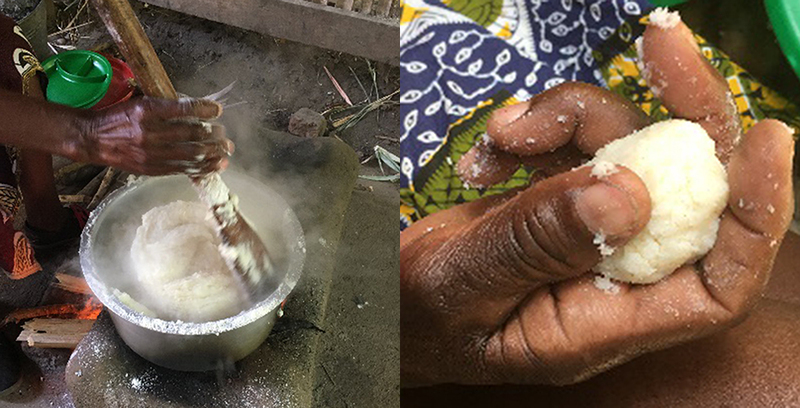 Maize flour is also commonly combined with water and sugar to form a porridge which is consumed at breakfast and given to young children. 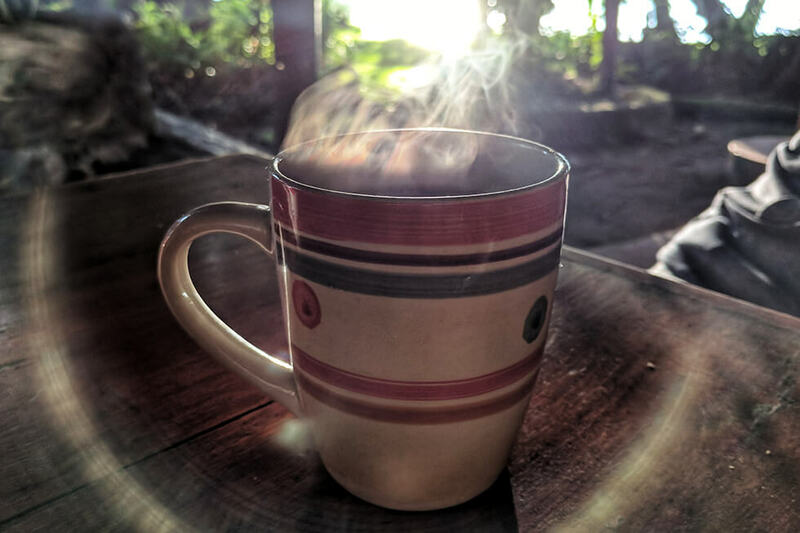 Generally, food is focused on sustenance rather than enjoyment and health. Whilst incredibly filling, the staple Nsima has poor nutritional value and its predominance in the Malawian diet is reflected by widespread malnourishment and micronutrient deficiencies. 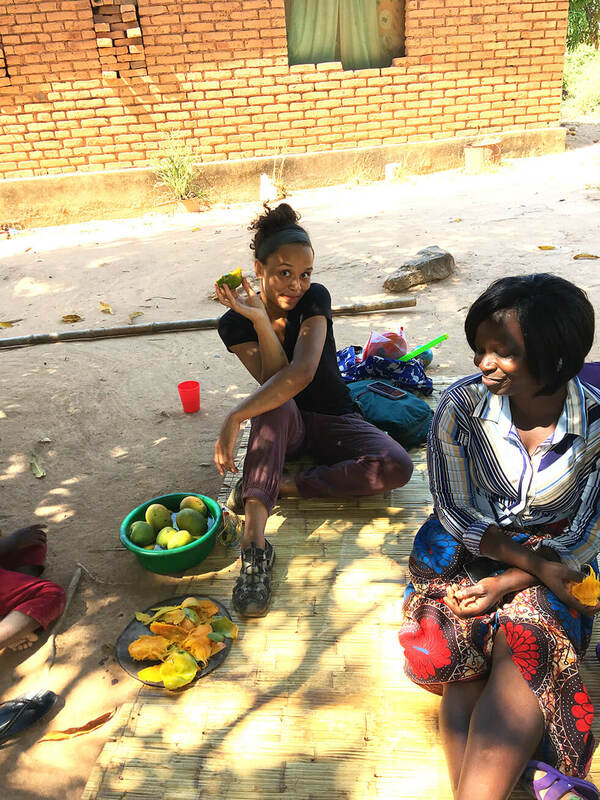 Despite the monotonous traditional Malawian diet, the markets boast fresh seasonal produce, providing a sensory feast of colours, smells and textures synonymous with the hedonic experience of eating. It was my job to transfer this into local cooking practices! During my time in these close-knit communities I was able to start cooking workshops with women from three of the local rural villages. As dietary choices converge with close social connections, particularly in cohesive communities, targeting social eating norms through group intervention was hoped to address the complexity of breaking dietary habits. 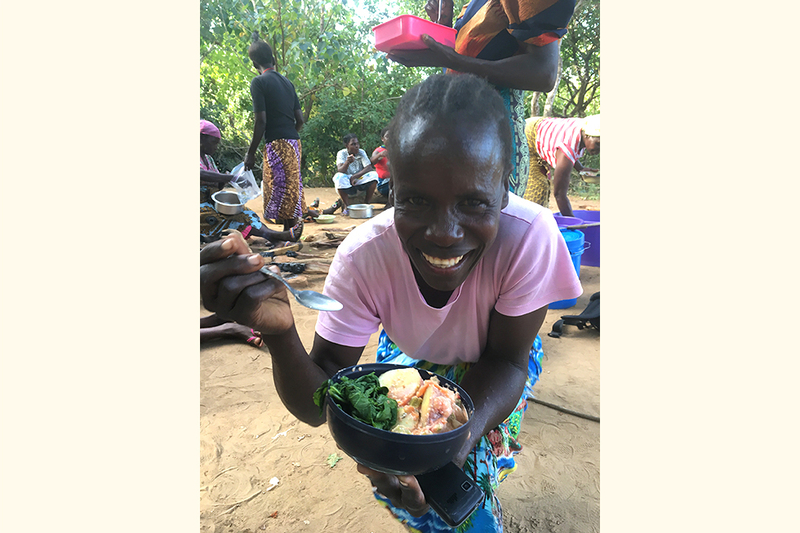 Women are the backbone of society in Malawi and thus empowering women to make adaptations to their diet stands to benefit the whole family, including future generations. I was humbled at how quickly the women welcomed me into their groups and how enthusiastically they engaged with cooking the recipes, which were sometimes thought of as slightly odd at first! Combining different food groups in one dish was a novel concept but one which the women quickly adopted and reportedly shared at home, much to their families delight! 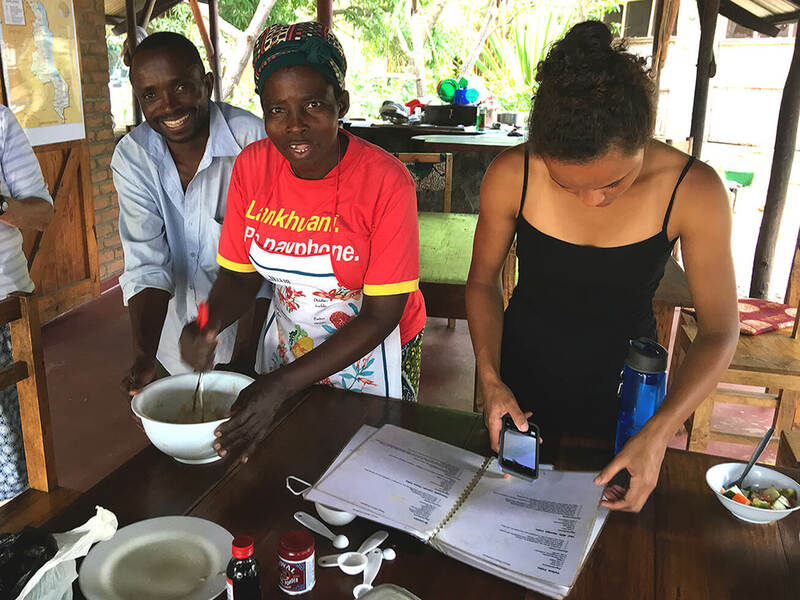 Whilst Malawi’s shared love of Nsima is deeply engrained in cultural tradition, through introducing appetising dishes using local produce my aim was to add diversity to the diet, with the shared goal of improving health and bringing enjoyment to food. After all cooking together, we would share the meal sat in a circle on the dusty floor, children on our laps and shooing away rogue chickens. Seeing the reactions of genuine pleasure amongst the communities was truly amazing. Eating for pleasure is such a fundamental joy of life and it was a privilege to share my love of food with these incredible women. 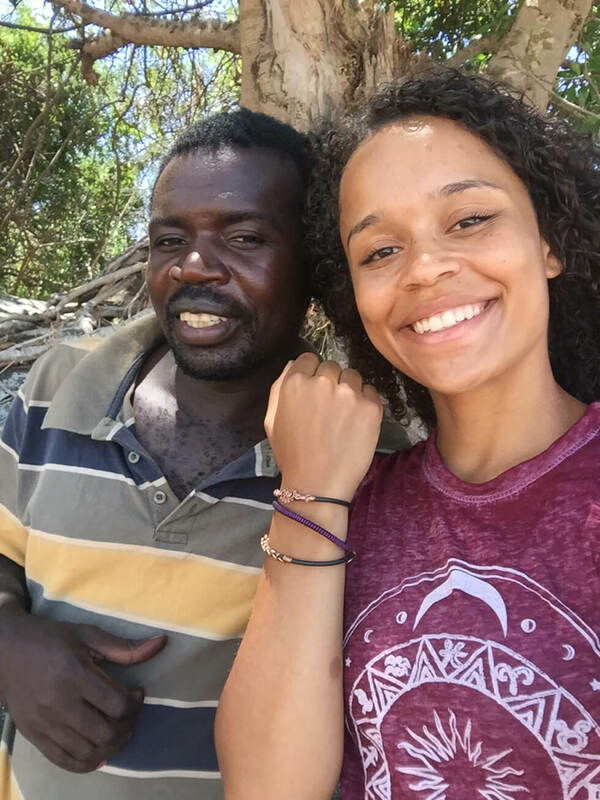 Teaching volunteers Kade and Emma have written a story about their time at Mwaya which is reproduced below. 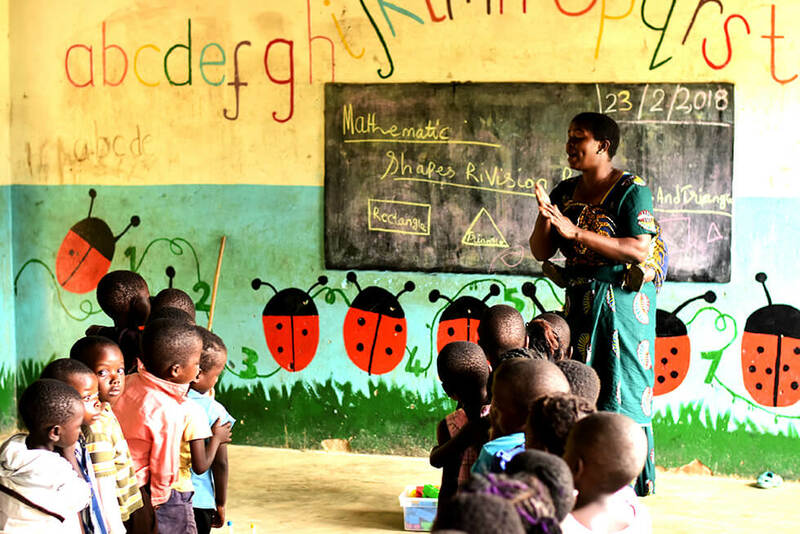 Stories written by other previous RIPPLE Africa volunteers can be found on the Volunteers’ Stories webpage. With incredibly limited volunteering experience behind us, it was a little bit daunting traveling halfway around the world to volunteer in a country that has plenty of warnings behind its name. 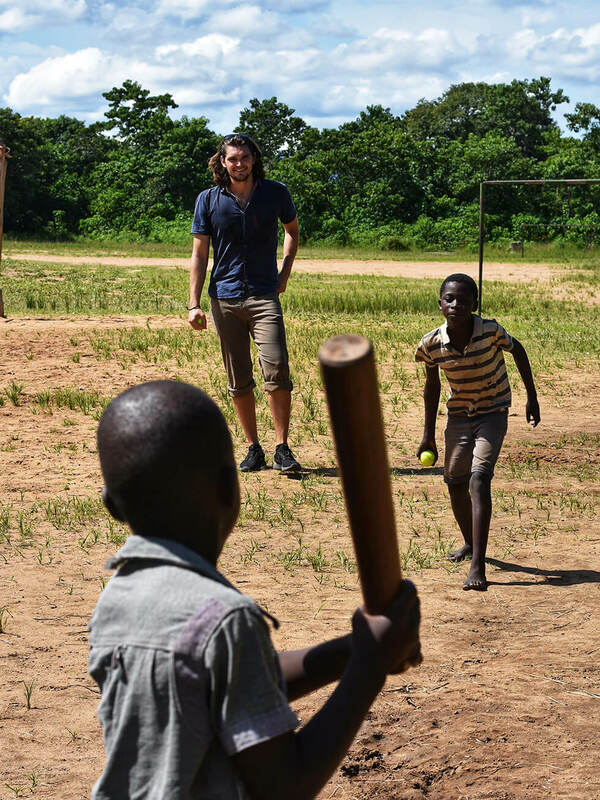 But upon arriving at RIPPLE Africa after a nearly 10 hour taxi drive from Lilongwe, our fellow volunteers made Kade and I feel incredibly welcomed, which certainly helped relax us into our surroundings. Arriving on Friday evening, we were able to explore the area over the weekend before our introduction with Dan on the following Monday morning. Fellow volunteers, Alistair and Doreen, took us under their wing, and not only helped organize bikes for us, but familiarized us with the staff, several towns and routes to take. Come Monday, we felt better prepared for the week ahead. We were really grateful for their help, and were sad to see them go only after a couple of days after our arrival. While both of us were interested in the teaching sector, and thought that our main focus would be the older students at Mwaya Primary and Kapanda Secondary School, it was the younger children at the Pre-Schools that really captured our attention. 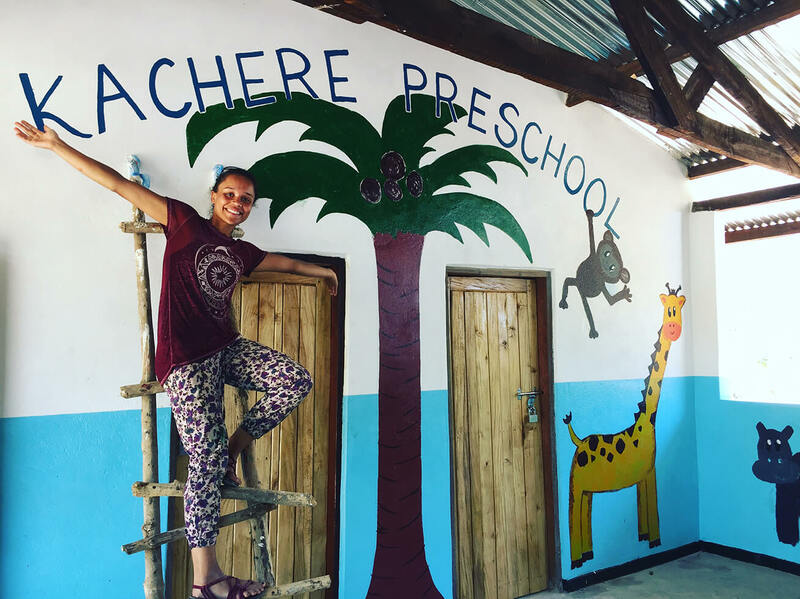 The enjoyment of learning new skills, games and dances was contagious, and after a couple of weeks in, our mornings were soon taken up with being based at Mwaya Pre-School. Colouring activities, and games identifying shapes and colours were implemented, using the resources that we found at Mwaya Beach. The relationships formed with the teachers, in particular Rebecca and Messi, were also rewarding, and the tea and sweet potato shared at the end of the school sessions was highly looked forward to. 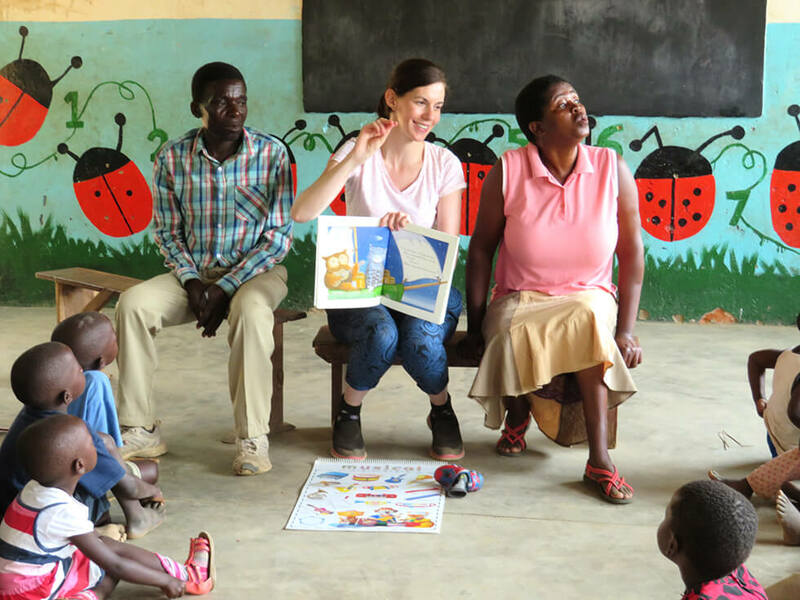 With Kade assisting teachers at Kapanda Secondary School, as well as taking several social studies classes, I was able to associate myself with the English teacher, Birgit, who was based there under Peace Corps. We were able to take a couple of her classes when she wasn’t able to be there, and I assisted her with the newly established English Club. Using my journalist background, I introduced to the students the role of media in today’s society, in particular, the importance of newspapers. Over five weeks, students were able to identify the structure of articles, different forms of media and their importance, and were able to create their own front page (in hope of stimulating the formation of a school newsletter). This was done by myself purchasing a collection of newspapers, and cutting them up to create headlines, photographs to go with articles the students had written themselves. I provided them with glue and scissors, as well as the card that they used for their front page. English club is held after school hours, and the students who attend are really enthusiastic about attending. To see the joy and creativity that this simple task brought out in the students, with the limited resources available, has been the highlight of my time at RIPPLE. The skills that were learnt through this project will help benefit these students as they go into essay writing, and I hope that new volunteers are able to continue on with assisting at this recently established group, and bring new ideas to help assist these students in the near future. With most of the teaching done in the morning, that meant our afternoons were left free for sports. 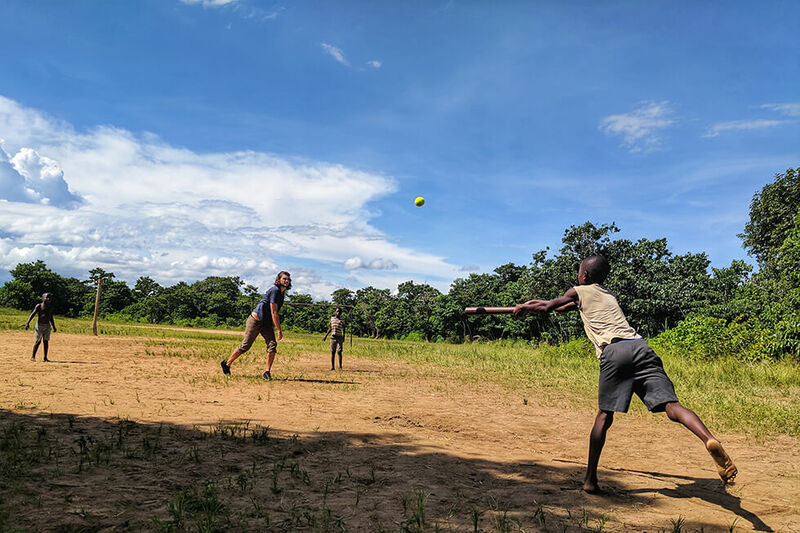 Netball, soccer, and volleyball were just a few that we took part in, and Kade was able to introduce baseball to the students at Mwaya Primary School. After a couple of sessions, the students were able to understand the concept and began to enjoy the game. Five weeks came and went extremely fast, and it was time to say goodbye, but not before we had several items of clothing made by local dressmaker, Patrick, for presents back home, and attended church. 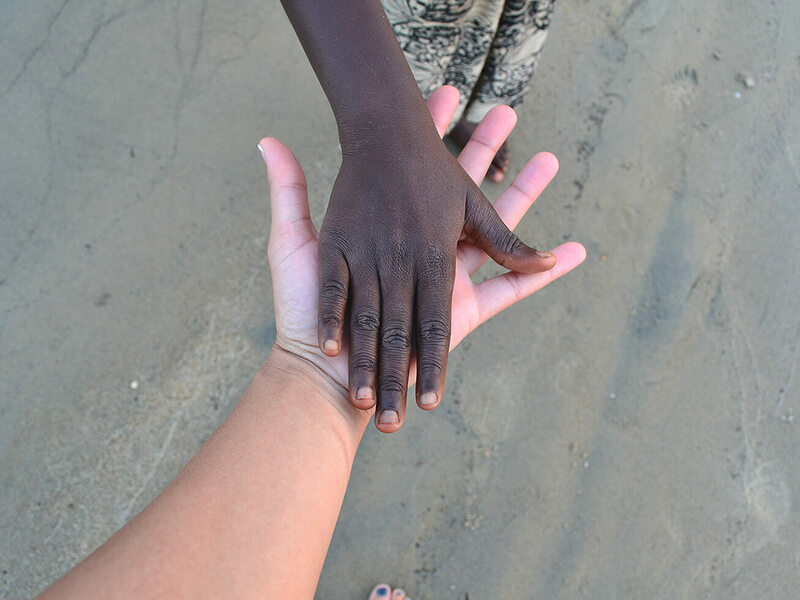 The great thing about RIPPLE and Mwaya Beach is that while you able to have your own space, you are also made to feel part of a family unit, and saying goodbye to fellow volunteers, and staff, was hard. In particular, our master chefs Geddess, Fabiana and Martha; their dishes could give Gordon Ramsey a run for his money, and their sense of humour was fantastic. Thanks RIPPLE, we have enjoyed our time here, and while our short stay meant that ‘change’ was seen, we felt that our skills shared and our time invested would help those who took them onboard in the near future. 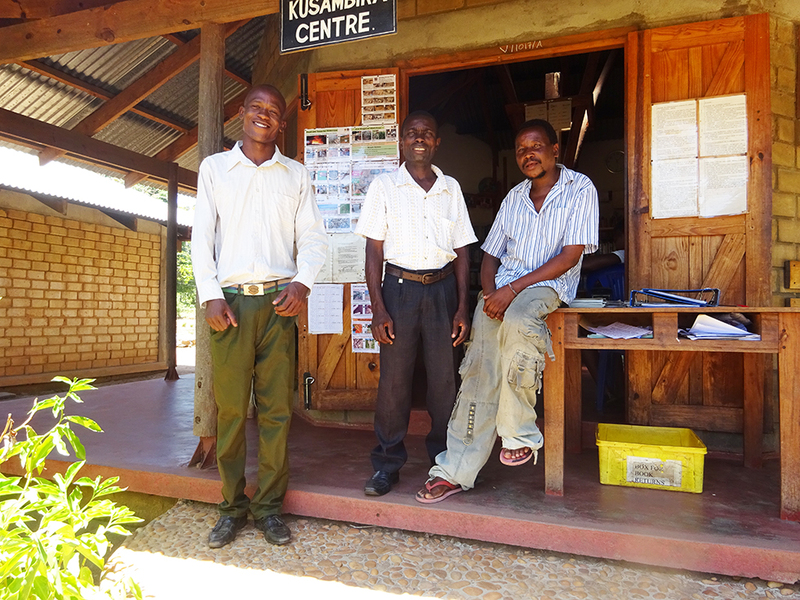 Medical volunteers Alistair and Doreen have written a story about their time at Mwaya which is reproduced below. 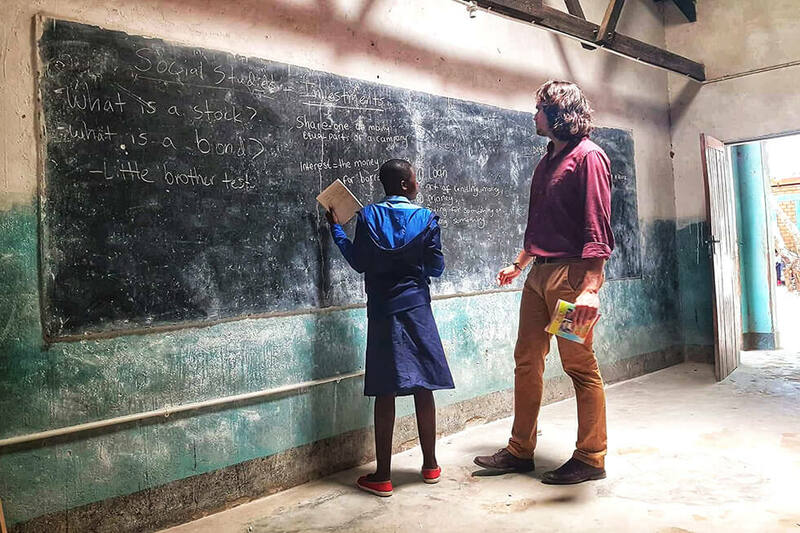 Stories written by other previous RIPPLE Africa volunteers can be found on the Volunteers’ Stories webpage. 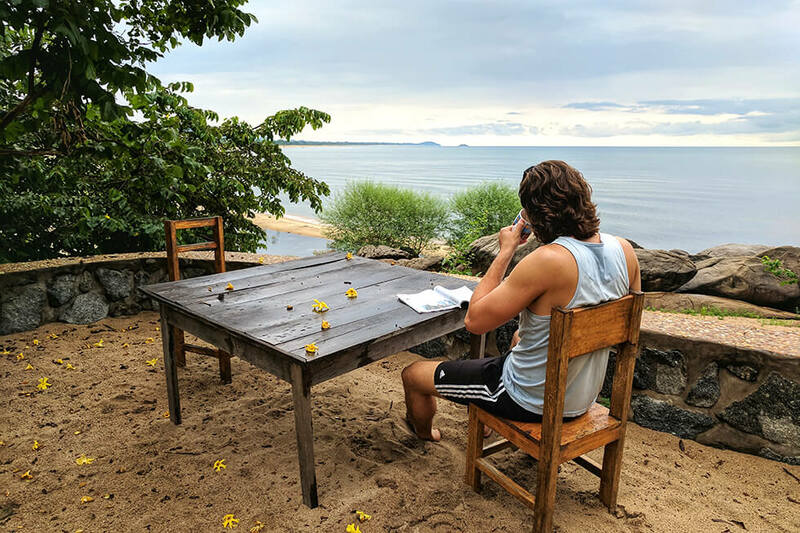 In November 2018 myself and Alistair Watson arrived at Mwaya Beach to start 12 weeks voluntary work with RIPPLE Africa. Before arrival it had been decided that I, using my nursing/health visiting background would work with Matilda, the Co-ordinator of the Disability Project. 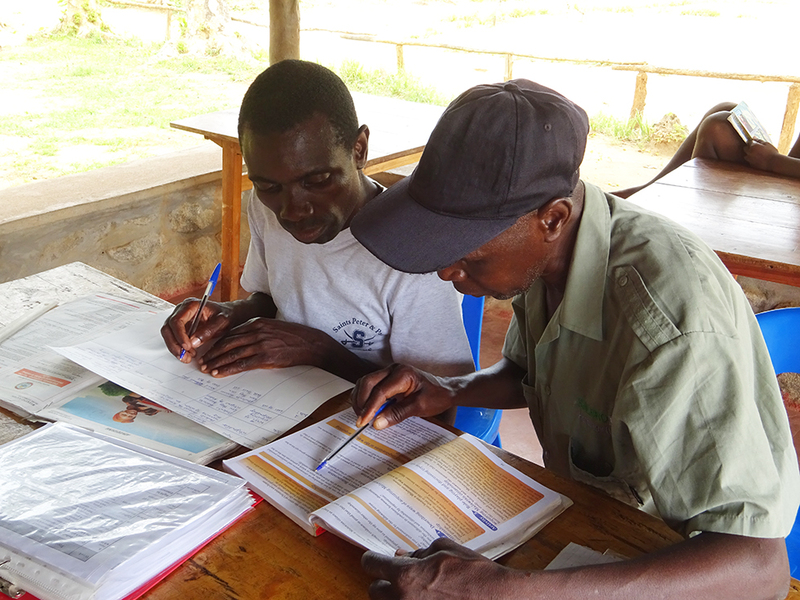 Alistair, a retired G.P., was earmarked for work in the local clinics and hospitals at Kachere, Kande and Chintheche. 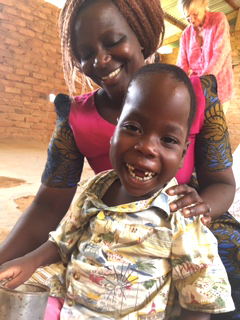 Unfortunately problems with medical registration in Malawi meant that Alistair was unable to do clinical work. 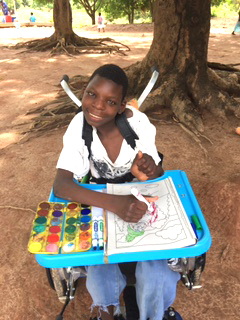 Fortunately the induction course at Mwaya provided Alistair with the opportunity to meet Matilda and do some visits with myself and Matilda, and quickly realise that working with the Disability Project would allow him to utilise some of his clinical skills and complement the educational skills of Matilda and my health visiting skills. The following 12 weeks proved to be an amazing learning experience and happy, joyful experience for the intrepid trio that we were. Mornings were spent cycling, mini-bussing and walking to visit clients who were unable to make their way into clinics. Home assessments allowed a holistic approach where medical and social problems could be identiﬁed and appropriate management plans and referrals formulated. 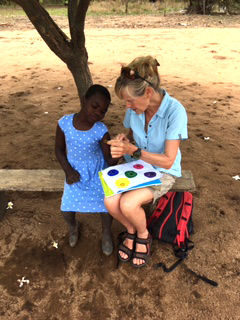 Afternoons involved group sessions at Kachere, Kande, Chituka and Mwaya where further assessments, along with massage/stretching and play therapies, were the order of the day. Despite encountering poverty, malnutrition, severe medical problems and disability on an almost daily basis, we were increasingly touched by the welcome we received and the warmth and happiness encountered when we met clients and their families. Matilda was inspirational and had a wonderful relationship with all the children and families. She was also very skilful in getting the mangoes off the trees! We visited various organisations and charities that support children with disabilities. Our aim was to try and achieve a more collaborative approach to the care of children with disabilities. One of our highlights was a sixteen year old boy who had cerebral palsy, requiring a wheelchair. It transformed his life. He was able to sit up and eat his food, paint, be part of his family and observe his surroundings. He seemed very happy and so were we. Back at base we loved being part of the Mwaya community and so grateful to all the staff who made our experience so enjoyable. The homemade peanut butter was the best and hard work to make. I won’t forget the mangoes – they were delicious! Our experiences will live with us forever. 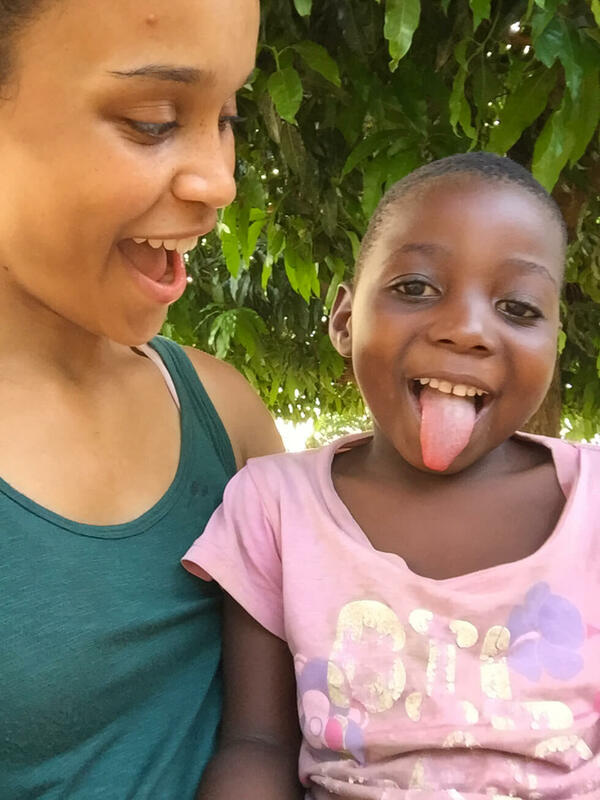 Volunteer Occupational Therapist Sibongile has written a story about her time at Mwaya which is reproduced below. 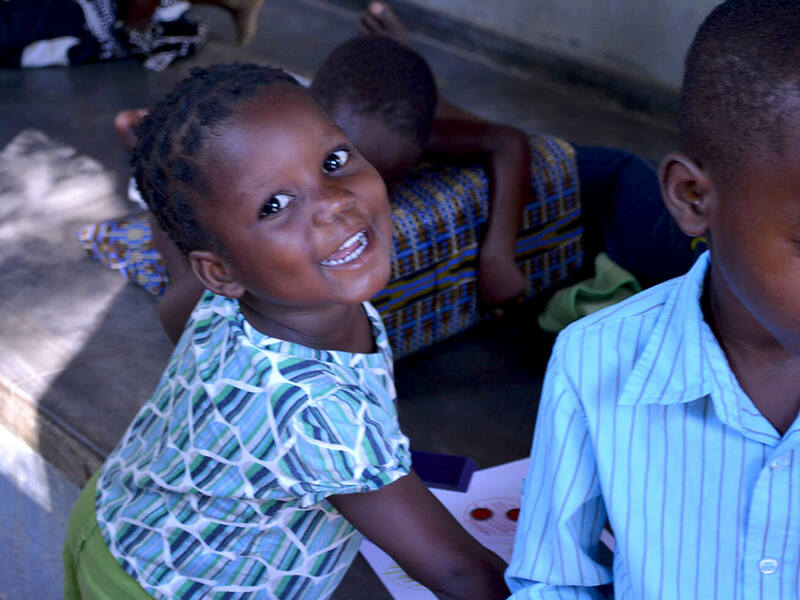 Stories written by other previous RIPPLE Africa volunteers can be found on the Volunteers’ Stories webpage. 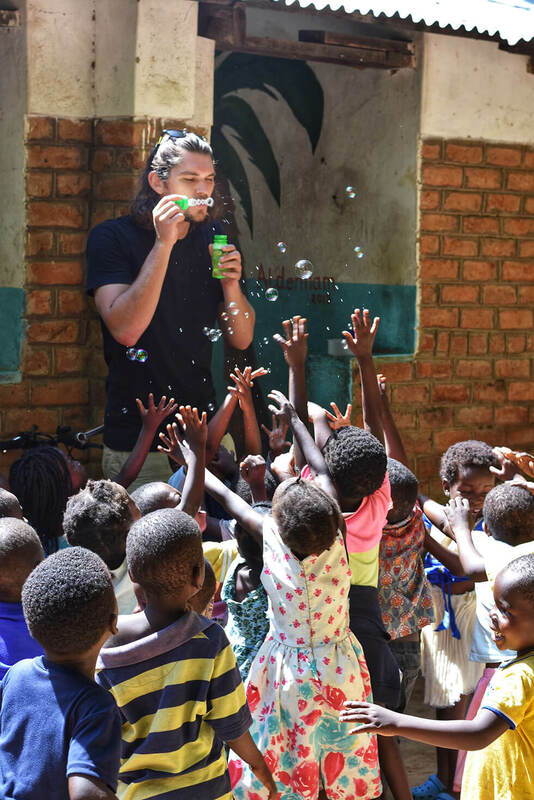 Going to volunteer in Malawi, Africa with RIPPLE was the best experience of my life. I grew so much as a person, learned so much, and gained a heartfelt appreciation of life itself. It was an eye-opening experience to emerge myself into the villages of rural Africa and to compare the standards of living there to my life in the US. 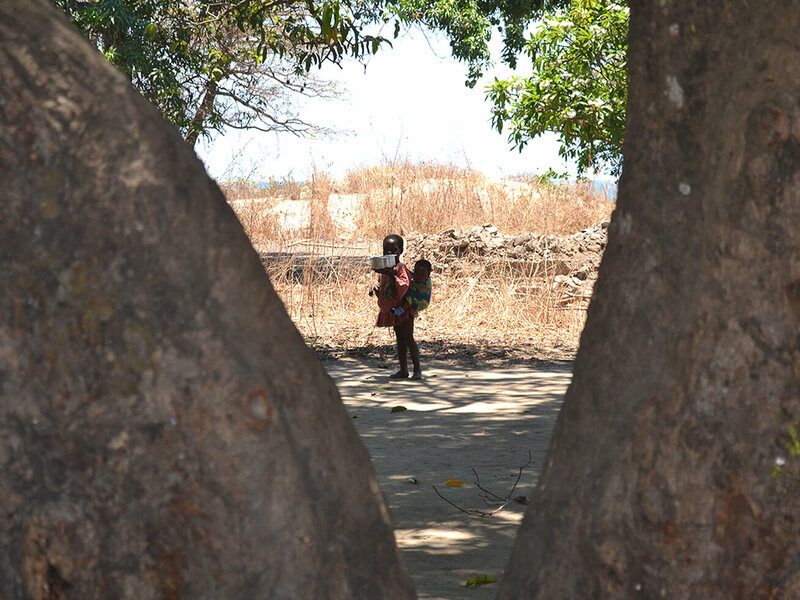 The Malawian people were so happy, friendly, and welcoming—taking nothing for granted. It was truly a humbling experience to be able to go there and serve those communities. 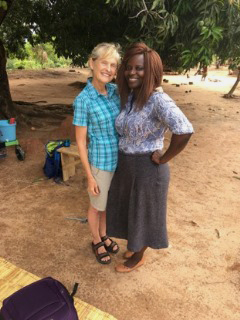 As a volunteer of the Disability and Rehabilitation program, I worked one on one with an amazing Malawian field worker, named Matilda. She taught me everything I needed to know to navigate the area and to communicate with the locals. We shared so many smiles and laughs together and I will hold my memories of my first trip to Malawi forever. 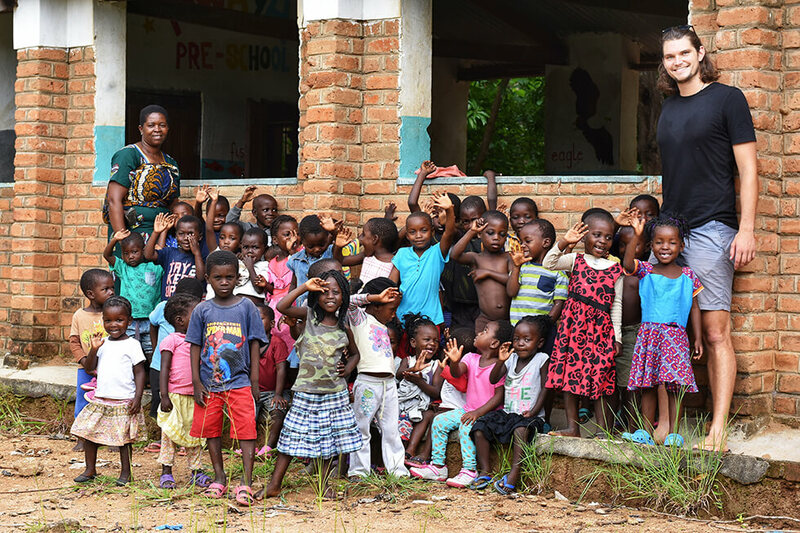 Being able to use my knowledge and background as an Occupational Therapist was so rewarding when treating the children in these villages. There are so many things that we take for granted that are non-existent or not easily accessed in Africa. I really felt that my work there was much needed and appreciated by the communities! It was so inspiring to see how the people of Malawi could make something out of nothing. I found that people there were so resourceful with the limited materials available. 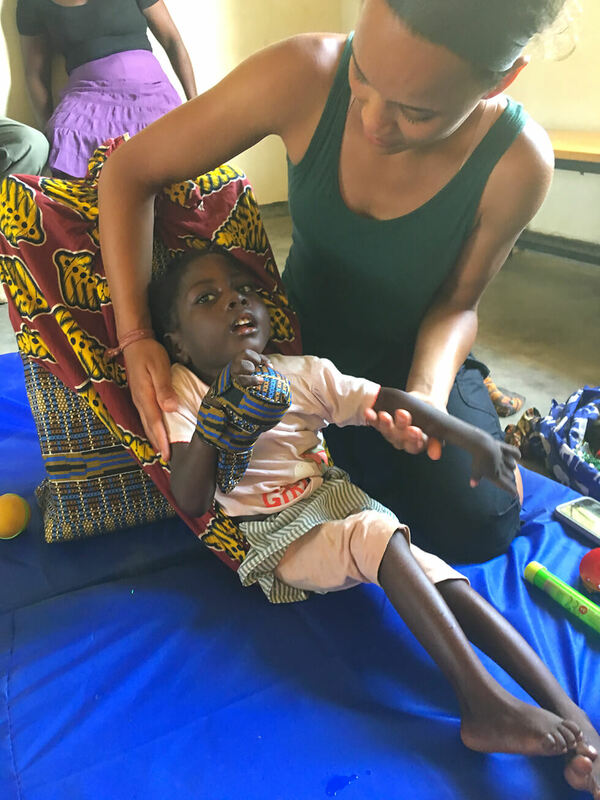 During my stay at Mwaya, I learned to use what I had to build makeshift materials that were much needed for treatment sessions. I was able to make soft splints using toilet paper rolls, soft balls, fabric, and foam. I even made a positioning wedge with some superglue, cardboard, foam, and material. I certainly got better at hand sewing! Aside from the amazing experience of being a part of the Disability Program, the volunteers and workers that I met at RIPPLE made a lasting impact on my life. I was able to meet people from all over the world who shared their ideas and insights with me. I had fun learning how to pound peanut butter, cook some local recipes, make bracelets, and—of course—gather all the delicious mangoes. 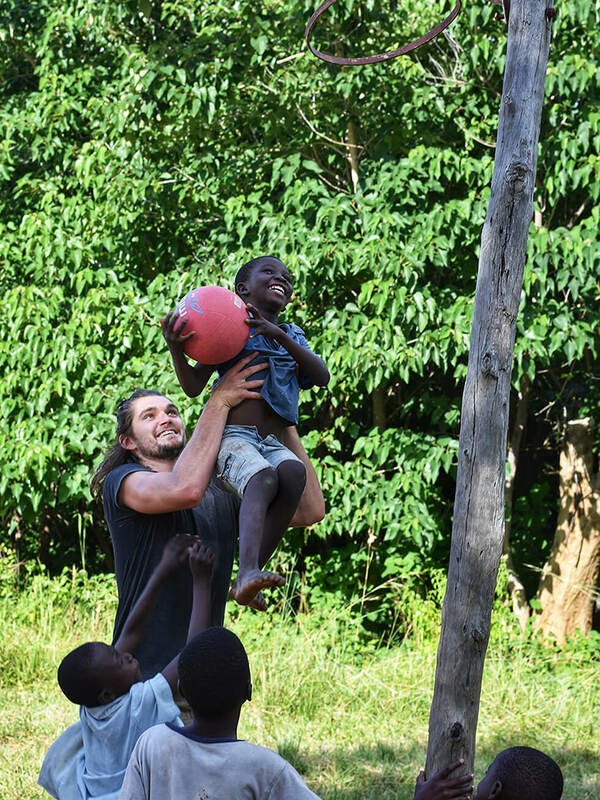 I cannot wait to go back to Malawi and experience it all again. 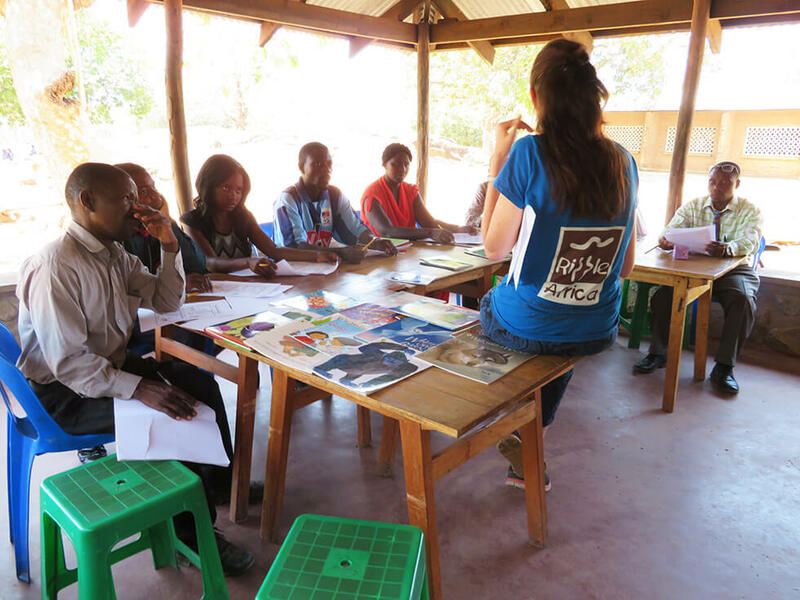 Volunteer teacher Emma has written a story about her time at Mwaya which is reproduced below. Stories written by other previous RIPPLE Africa volunteers can be found on the Volunteers’ Stories webpage. Having previously volunteered in Zambia and Malawi in my summer holidays, I knew just how rewarding it could be. As a primary teacher I wanted to work with teachers for a longer period and during term time, sharing skills and empowering them in any way I could. My Headteacher in the Netherlands agreed that I could have 10 weeks of unpaid leave and then the planning began. I stumbled across ‘RIPPLE Africa’ and had a strong feeling that this was the right charity for me. On arrival, I realised my instinct was correct and I could instantly see that RIPPLE Africa really was living out its ethos of ‘Offering a hand up not a hand out’. From the moment I arrived, I felt at home here. The staff, other volunteers and entire community have welcomed me with open arms and I will be sad to leave – 2.5 months doesn’t feel long enough! I began my placement helping the adult literacy classes with the planning and delivery of lessons, as well as helping to make resources for them such as comprehension question cards to accompany sets of books. I learnt a lot during this period and developed a lovely rapport with the two teachers, Allamson and Burton. Even when the Primary and Pre-schools started back in mid-September, I still regularly popped by to see them both and talk through ideas for their classes. I also helped conduct a survey to find out the effectiveness of the sweet potato scheme at the pre-schools as well as helped at the tree nursery to bud, graft and water plants there. I was also lucky to spend a day gaining insight into the fisheries project and attended a meeting with chiefs and villagers as well as the RIPPLE fishery team learning more about the amazing work RIPPLE Africa are doing to aid fish conservation. 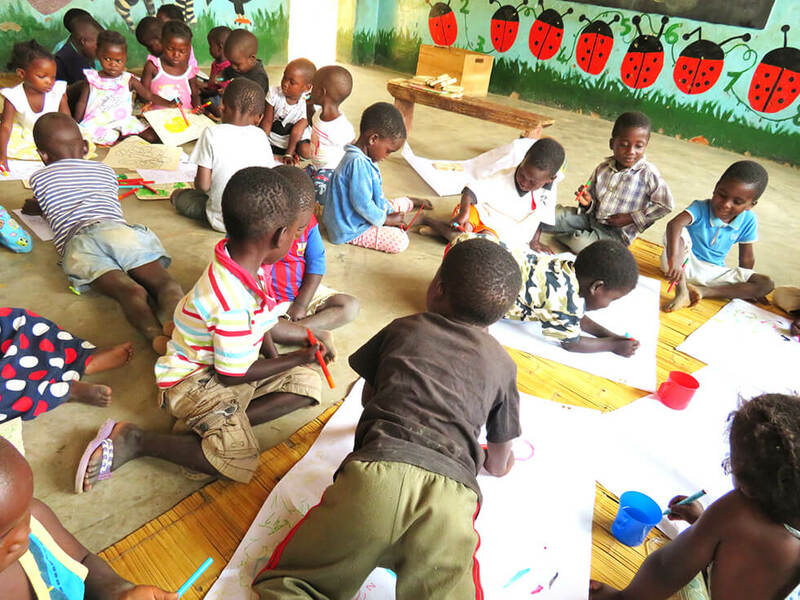 At Mwaya Pre-school, I have sung alphabet songs, read picture books, used puppets and painted with the children. It has been a huge amount of fun and the teachers there have been nothing but enthusiastic and friendly. I shall miss their smiling faces every day. 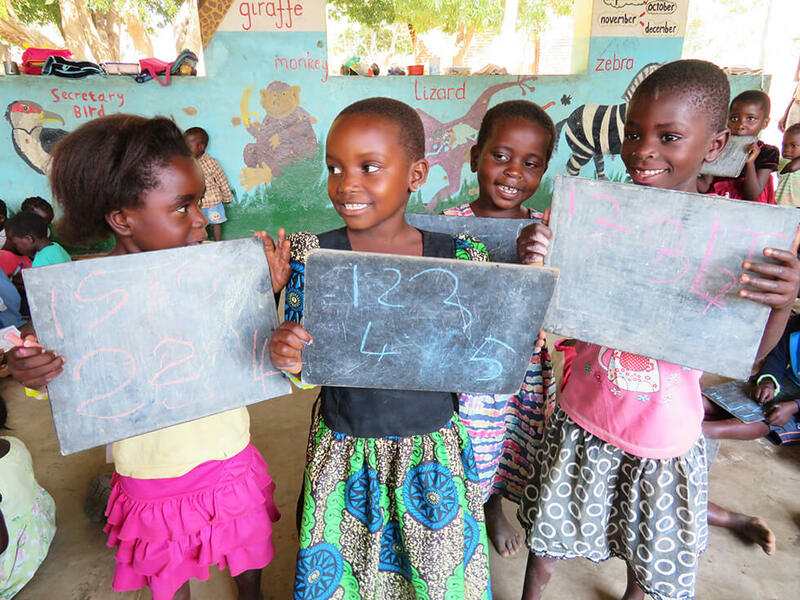 At Mwaya Primary, I have been mainly helping Standards 6, 7 and 8 in English lessons – both delivering content and assisting the teachers with marking, resource making and English grammar/vocabulary. I have created interactive displays in the Standard 8 classroom, introduced ‘Hotseating’ (whereby I am in role of a character of a story and the children ask questions) in Standard 7, helped with classroom/behaviour management ideas and aided comprehension skills via different uses of questioning across all year groups. A highlight was delivering a 2.5 hour training workshops for the Mwaya Primary staff on phonics, critical thinking, questioning, comprehension – including the concept of ‘Book Talk’. I think the staff enjoyed it and many said afterwards they were excited to adopt some of the ideas I demonstrated. I’ll miss all of the new friends I have made here; the sound of Lake Malawi easing me to sleep; the weather; the sense of community here that we are slowly losing back home; the ability to single task and be more ‘mindful’; watching the monkeys swing from trees as I shower; the delicious daily food cooked by the superb RIPPLE staff but most of all the sheer infectious joy and energy displayed by the children I have worked with. I’ll be back again some day for sure. 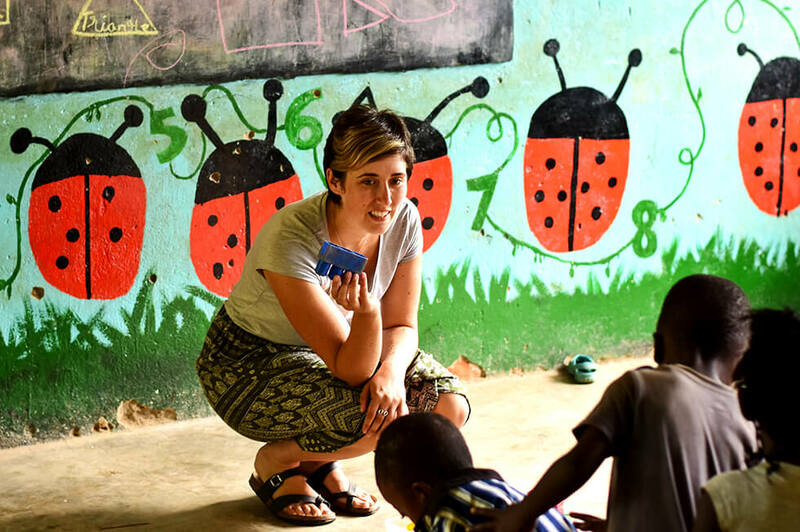 Thank you RIPPLE Africa for a truly life changing experience – it exceeded all of my expectations. You really are making such a difference to so many people. I will continue to be one of your most avid supporters!